Also, some call the Front Rider a Captain, others call those Front Riders Pilots. Back Riders, same thing, some call them Strokers, some call them, Stokers...and some call them, 'Poor Souls'. 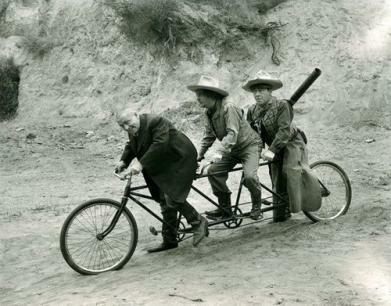 Photo of us on our First Tandem Bicycle out for our First Ride on our Cannondale Mt. Bike type Bicycle Built For Two...and yes, we might have sang the song, "Daisy Bell"; (Daisy Bell is the most widely know, most popular, Tandem Bike song, also know as "On A Bicycle Built For Two"). To Me? TANDEM: the original 'Power Assist' bicycle. Have you ever ridden a Power Assist Bicycle? 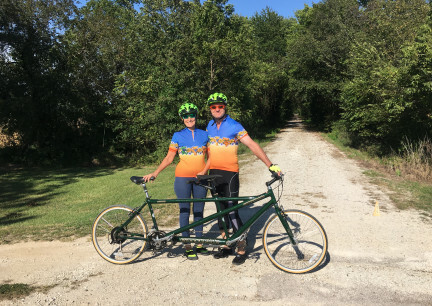 Have you ever ridden a Tandem with a good partner? I have ridden both. And, Honestly, much the same, as far as the power. Now. There is more to riding a Tandem than that. Team work is a must! But you CERTAINLY DO get a Power Assist with another rider on the same bicycle. 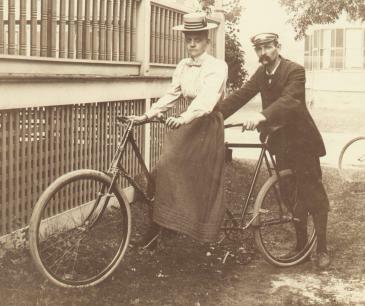 Bicycles Built For Two were a POPULAR mode of Transportation 'back in the day'. That is, back in the days of the late 1800's and early 1900's. Not only were they relatively inexpensive, you did not have to feed and care it like you would a horse, and 'petroleum' was not only expensive then, but also, NOT SO EASY TO FIND! 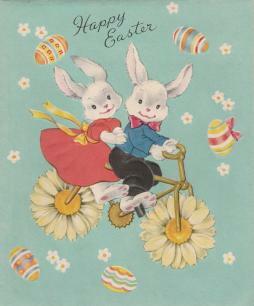 Couples have continued to ride and race on Tandems since the day they were first made. Deron and I live on right on the Katy Trail and it might surprise you just how many couples come by, usually fully loaded with camping and cycling gear, as they are off on a Tandem Adventure. I can now tell you from experience; Riding a Tandem, call it, Bicycle Built for Two, IS A LOT OF FUN! 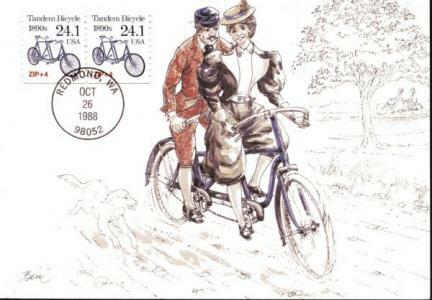 In 1988 the USA Postal Service printed a Tandem Bicycle Postage Stamp. The Postcard that the Stamps are on is also printed by the Postal Service. Stamp Collectors LOVE these sets. These and the "First Issue" Day, Printed Envelopes, that are only offered the first day the stamps come out. I know this because collect Postage Stamps with Dogs on them, mostly Sled Dogs. If you are interested in collecting Postage Stamps there are stamps with Bicycle on them from all over the World. 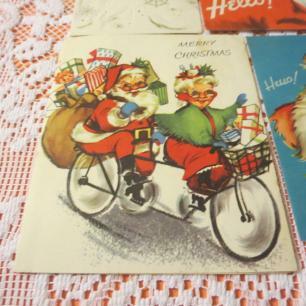 There are not just Postage Stamps but also Rubber Stamps in many types and some with riders, some just bicycles. Some have animal riders and are whimsical, others are more realistic. 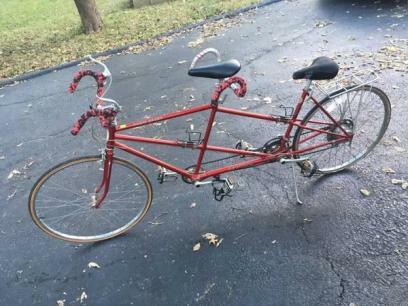 I had wanted a Tandem/Bicycle Built For Two for yeeeears! I look at them for sale on line, I walk toward them early when I go to Bike Swaps, I love the stories about them on line....and then finally, we did not buy just one, we bought two (more why later). Just call me, 'Daisy'. (some of you will get that right away). We went to a Bike Swap in KS in late Sept 2018. They had four Tandems sitting there...and of course, THAT'S where I went first. They were not bad prices on them. Two were Recumbent (no thanks) and one was a Santana Road Bike the other....A CANNONDALE MT BIKE type. Very shortly after I looked at them, the owners of the Bike Store were walking around LOWERING prices on tags. When they got to the Tandems I asked what the Cannondale was going to cost....he shot us a VERY low price, we rode it and the Street Strider (but it is another story) and I made an offer on both...we bought them... and bags full of other wonderfully priced items of Jerseys and Park Tools and such. We took the two apart, folded, and such and they rode home in the back of our Suburban. Deron took them back out and reassemled them as soon as we got home, and YES! We tried and loved them. Deron was 0f course able to ride the Street Strider right away, Me? Not so much. As we rode to Church on our Bicycle the next morning we talked about the Santana Road Bike we left behind. We decided that I would call the Bike Swap and see if they still had it, make a low offer for it and the Park Tool Stand, and see where it all landed....they Countered Fairly and we spent another day in our Vehicle driving to KS and back. I am kind of a 'control freak'. I will not clip my feet into the Bicycle Pedals! There is a saying about Tandem Bicycles and Canoes....."Where ever your relationship is, it will get there faster!". Another words. If you have a good relationship, LOTS of fun fast miles. If you have a bad relationship, it will get worse faster! HA HA! So????? "Deron! LOOK OUT!". After we took our first 6 mile test ride, our relationship still wonderful we are still laughing about the ride, can't wait for the next. Actually, we had a whole LOT of fun. Strava says we got it up to 23 mph (25 the next day on the other Tandem).....and we were not even trying! Now? We want to get out there and try and see what happens/how fast! I have learned to 'never say never', but my thoughts right now on taking our Cannondale Mountain Bike Tandem Bicycle out on Mt. Bike Trails....No Thanks! But for the Katy Trail or any type like it, or Roads....OH YEAH! Our first two times out on our Cannondale Tandem we reached speeds we were surprised to see. It handles very well and is so easy to get moving! Our Santana Sovereign is a Road Bike Tandem. But Man! It ROCKS down the Katy Trail! This is a photo of us the first cold, wet, Oct day, 2018 and we still rode the Santana to Church. 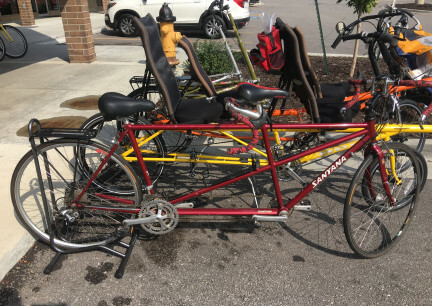 We really bought this 1970s Schwinn Sport Tandem just for a bit of fun as a Lawn Ornament that we could ride and or share for others to ride with us for short fun rides. This one, is rideable. But needed a lot of work to really be a fun to ride, go to town on Tandem. Many of the bolts and such needed tightening, and the brakes needed work. 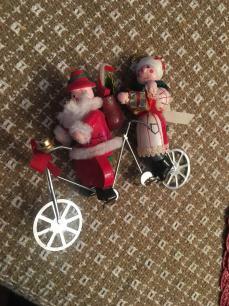 As I said, we really bought it for a have a little fun, short rides, Lawn Ornament for the Holidays out front bike. The real question is...Why NOT more than one Tandem Bicycle!? We live RIGHT on the KATY Trail. Our Property actually starts right on the KATY Trail. So? We ride a lot. We have people over to ride a lot. Why not have a little more fun in life more often? Why not let others ride a Tandem along with us. Why not have Tandem Races!? 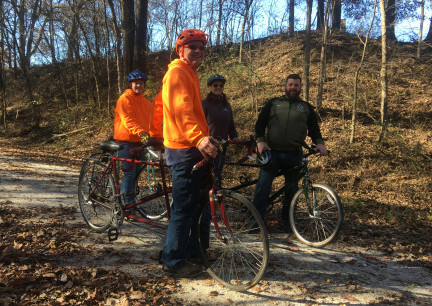 Why not invite another couple over and just mosey down the trail visiting all there right together, chatting and laughing, as we ride the Tandems down the Trail? Deron and I have met the NICEST folks out on their Tandems. Some things we have noticed about Tandem Riders; Most, but of course not all, are Couples, usually Married and most have been Married a while. These folks love Cycling and Adventures. These folks SMILE a LOT! 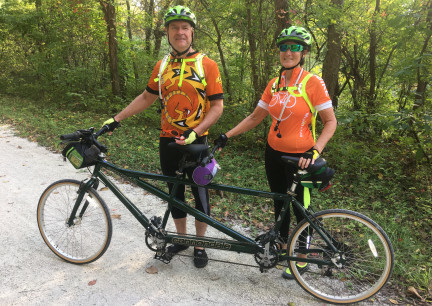 When you are on a Tandem and meet another Tandem couple out on the Trail, conversations are easy and fun. Many invite you to their homes, even out of State. There is that instant community that occurs. The more I read, the more I talk to folks that ride and have ridden Tandems for years, the more I learn. And there is a LOT of Fun Trivia about Tandem Bikes! 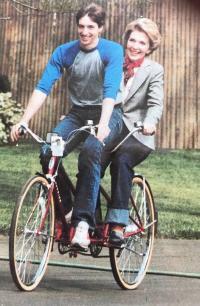 *Did you know that Schwinn made the Tandem Bicycle for the 1968 - 1971 Olympic Races? It was called. The Paramount Tandem. *Between 1893 - 1900 Pneumatic Tires and 3 Speeds were being offered on Tandems...according to The Tandem Book, a person could choose from, at that time, 100 Tandem Brands in the USA and Europe had many types also. *Did you know that there are several songs that mention or are about, Tandem Bicycles? 'Push Pedal' is one. 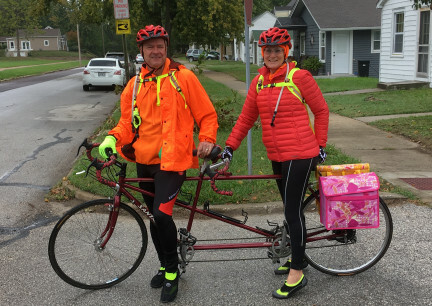 'Riding Solo on a Tandem' is another, and there ARE more. *Tandems have been Clocked at over 65 MPH on downhills! OVER 65 MPH! *Tandems, because of weight incurred and flexing of the long bicycle, need Tandem Wheels, not just Bicycle Wheels. 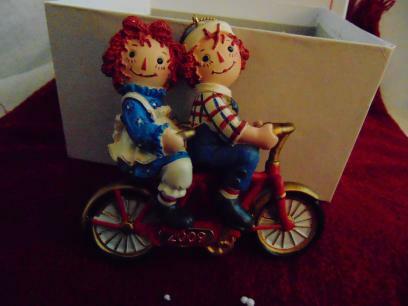 *There are many Collectable items that are made in the shape of a Bicycle Built for Two. *Did you know that Barbie has, not one, but a couple different styles of Tandem Bikes she can ride? 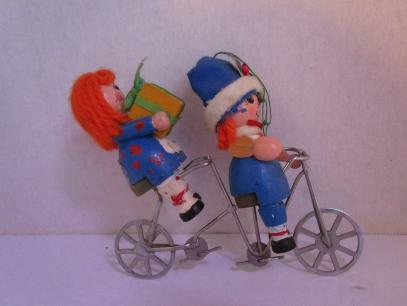 The Doll, Brats, also has a Tandem Bicycle. 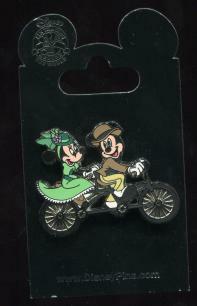 *Romances have Begun and Ended on Tandems Bikes! *Chain Guards were once called, "Skirt Guards". Ladies wore long skirts when Tandems were a big thing 'back when', and Bloomers and Over the Ankle Dresses became more popular as many more women started riding and enjoying the Tandem Bicycles. I guess this would be someone's last ride on a Tandem Bicycle, ey? Should not that Coffin be strapped down! This is a photo taken in the UK. I guess enough people love their bicycles and bicycle riding so much, they want to 'go out' this way. There must be a lot that would do this for the Company to make a Tandem Bicycle that would hold this load! Look closely at the photo. It looks to me as though there ARE two seats on this bike. 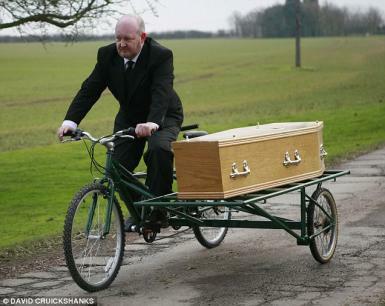 I bet with <clears throat>, let's say, 'heavier passengers', and or how uphill it is to the Cemetery, with 'dead weight', two people pedaling may be needed! The contents of this page for, Tandem Riding, is still under construction. We hope this, as with every page on this site, this page continues to grow. Please check back often.